Texas Tech quarterback Alan Bowman’s dad played for the Nittany Lions. Alan Bowman knows about the exploits of his father in college. Kirk Bowman played tight end at Penn State and caught the winning touchdown pass in a 27-24 victory over Nebraska, one of the highlights of the Nittany Lions' run to the 1982 national championship. He's been with his father on trips to Happy Valley "so he can reminisce over all his college days," he told the Lubbock Avalanche-Journal when he was in high school in Grapevine, Texas. Now, Alan Bowman is making a name for himself. 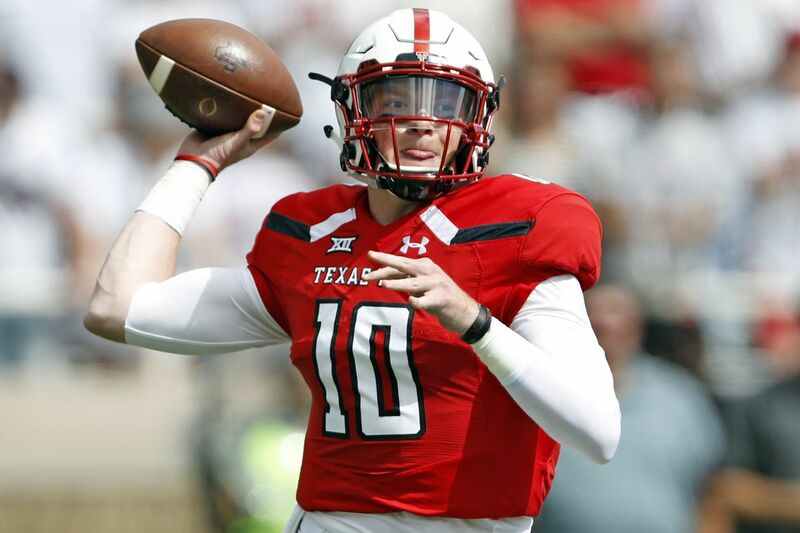 A true freshman, Bowman passed for 605 yards and five touchdowns last week in leading Texas Tech to a 63-49 win over Houston, and is the latest young quarterback to emerge in the Big 12. In three games, Bowman has passed for 1,160 yards and eight touchdowns, with no interceptions. "He's done a nice job of protecting the football and still cutting it loose and pulling the trigger when things are there," Red Raiders head coach Kliff Kingsbury said in an Associated Press story. "There's a fine line you walk there. You don't want to be hesitant, but you don't want to be reckless with the ball. He's kind of walked that line really well." Bowman, who has been running the offense since sophomore McLane Carter got hurt in the first quarter of the season opener, has a big test Saturday night at No. 15 Oklahoma State. Notre Dame head coach Brian Kelly is unhappy with Vanderbilt’s playing style. One day after Notre Dame coach Brian Kelly accused Vanderbilt of "bad football," Commodores coach Derek Mason fired back. "Brian Kelly can take his comments and keep it moving," Mason said on this week's SEC coaches' teleconference. "If he has something personal with me, he can come see me." Kelly contended that tight end Alize Mack was getting cut-blocked "maliciously" by a Vanderbilt defensive lineman in last Saturday's 22-17 Fighting Irish win. "It's legal, but it's bad football," Kelly said. "It's just bad football, and I have no problem saying it. We're so concerned about frontal cuts, and we got a defensive end chopping (Mack) on every play, and he hung in there every play." Mason replied, "I don't care much about Brian Kelly's comments about football. From the holding to the post-chops by Notre Dame, I thought it was bad football on their part." Former St. Joseph's Prep star Olamide Zaccheaus has claimed a spot in Virginia's record book, establishing a school record last week with 247 receiving yards on nine catches. Zaccheaus made quite a few yards on his own, taking short passes from quarterback Bryce Perkins and completing plays of 86 and 77 yards for touchdowns against Ohio. "Obviously, it's historic, and something that I'm going to take time to acknowledge," Zaccheaus told reporters Monday. "But at the same time, we have another game (Louisville) this upcoming week to prepare for." Purdue has been rolling up some terrific offensive numbers but has an 0-3 start to show for it. The Boilermakers are 19th in FBS in total offense (520.7 yards per game) and 17th in passing yards (325.7). Freshman Rondale Moore is fourth with 190.3 all-purpose yards. Last Saturday against Missouri, senior quarterback David Blough broke the Big Ten record for total yards, completing 39 of 55 passes for 572 yards and rushing for 18. But the Tigers kicked a walk-off field goal and won, 40-37. Penalties have been a problem. Purdue has been flagged 23 times for 245 yards, ranking near the bottom of FBS. 'Good football teams don't beat themselves," coach Jeff Brohm said. "That's self-inflicted wounds. We did multiple dumb penalties that have cost us." The Scarlet Knights have gotten off to a bad start. The Rutgers program has had its share of low points, but Saturday's 55-14 loss to Kansas might have been the lowest, especially since the Jayhawks were 4-34 since David Beaty took over as head coach. Head coach Chris Ash said that depth is an issue on defense, noting that 16 scholarship players "were not able to start the season with us or be in that game." "That was a hot football game," he said. "There was a lot of sit-down and get-up-and-go-play based off of the way this game was going with turnovers. Our guys were gassed." The Scarlet Knights host Buffalo on Saturday. Fifth-year senior Jamal Custis, a graduate of Neumann-Goretti High School, has established several career bests in helping Syracuse get off to a 3-0 start. He has 15 catches for 265 yards and three touchdowns while averaging 17.7 yards per reception. He opened the season with six catches for 168 yards against Western Michigan, good for two touchdowns. He had four receptions for 56 yards in last week's surprising 30-7 win over Florida State. Can Kellen Mond take down Alabama? Texas A&M at Alabama, 3:30 p.m., CBS3: Is there any team out there that can slow down the No. 1 Crimson Tide, who have outscored their first three opponents 170-28? The Aggies have Nick Saban's attention after coming close to upsetting Clemson, and quarterback Kellen Mond will be tough to stop. Kansas State at West Virginia, 3:30 p.m., ESPN: Mountaineers quarterback Will Grier (761 yards, nine touchdowns in two games) has to warm up his potent right arm again after Hurricane Florence forced the postponement of WVU's game last week. The Wildcats have been decent against the pass. Texas Christian at Texas, 4:30 p.m., Fox29: The Horned Frogs couldn't hang with Ohio State last week, and now they face a Longhorns team that has some momentum after defeating USC. TCU has won four straight over Texas, outscoring its intrastate rival by an average of 38-8. Stanford at Oregon, 8 p.m., 6ABC: The Cardinal's Bryce Love, who rushed for 2,118 yards last season, is back from an injury and hopes to return to 2017 form. The Ducks' defense has allowed 1.96 yards per rush and 77 yards per game, but has done it against Bowling Green, Portland State, and San Jose State. Wisconsin at Iowa, 8:30 p.m., Fox29: The Badgers couldn't have found a worse situation, fighting for their playoff lives at night in Iowa City after a shocking home loss to BYU. The Hawkeyes are second in the nation in rush defense (42.0 yards per game), and Wisconsin's Jonathan Taylor will test them. Murray, who is in his second season with the Sooners after transferring from Texas A&M, went 21 of 29 for 348 yards and three touchdowns, and also rushed for 77 yards, in last week's 37-27 win over Iowa State. For the season, he has completed 67 percent of his passes for 863 yards and eight touchdowns. With running back Rodney Anderson out with an injury, he also tops Oklahoma in rushing yards with 169.